I recently got the opportunity to test out a new, revised version of the Coachella Shorts by Striped Swallow Designs. 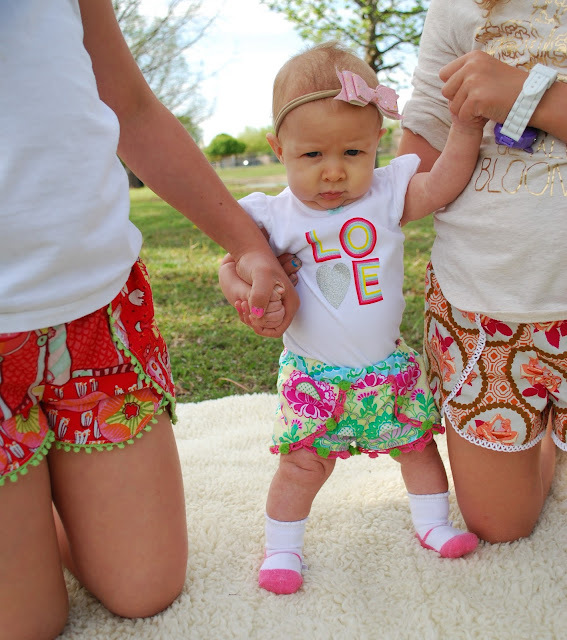 I volunteered to test the shorts on baby Hannah, but after I made her a pair, I had to make her sisters some as well. They were just too cute, and I know they will get a ton of wear in our hot summers. The Coachella Shorts was the first pattern that Striped Swallow released, and they decided it needed a little bit of an update with an improved fit. I am very happy with the fit on all three of my models. For baby girl I chose 6 month size. 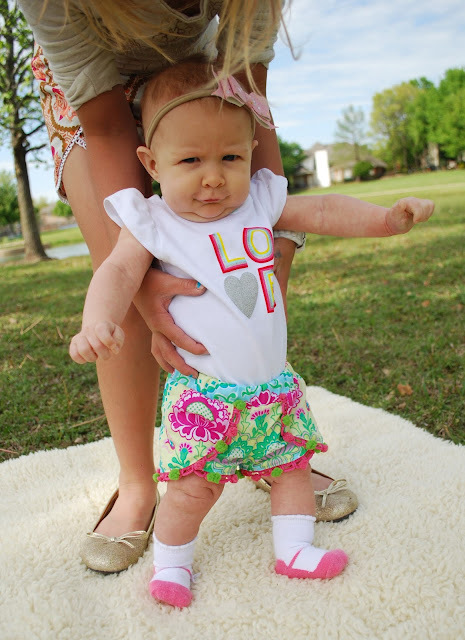 She is 3 months in this photo and wearing a cloth diaper. 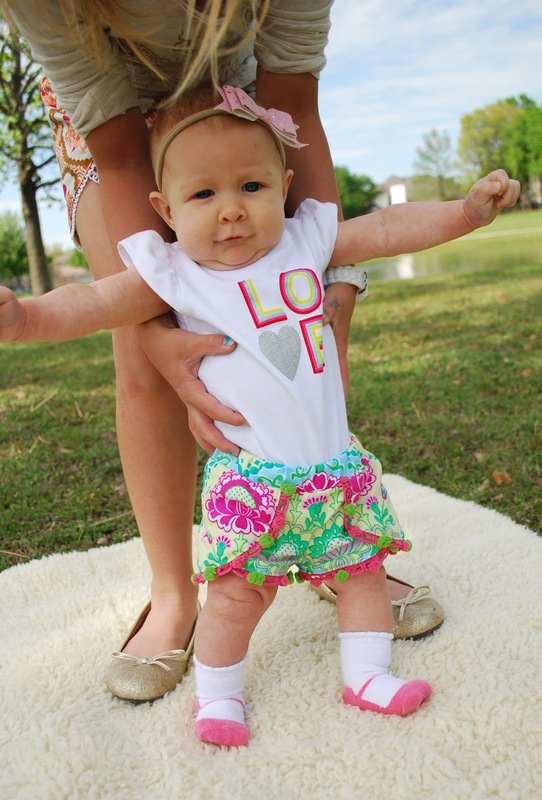 I chose her size by measuring her WITH a cloth diaper on so that the shorts fit her bigger cloth diaper bum. For my 7 year old daughter, I made a size 7, which is exactly where her measurements fell. For my oldest daughter who is 9, I made a size 12 width with a size 10 height. The pattern gives very simple instructions on how to adjust when measurements don't fit exactly into the chart. I felt the shorts run true to size. They had plenty of room to play around. You wouldn't know it by these photos, but trust me, the outtakes were many! I used quilting cotton on all of my shorts. 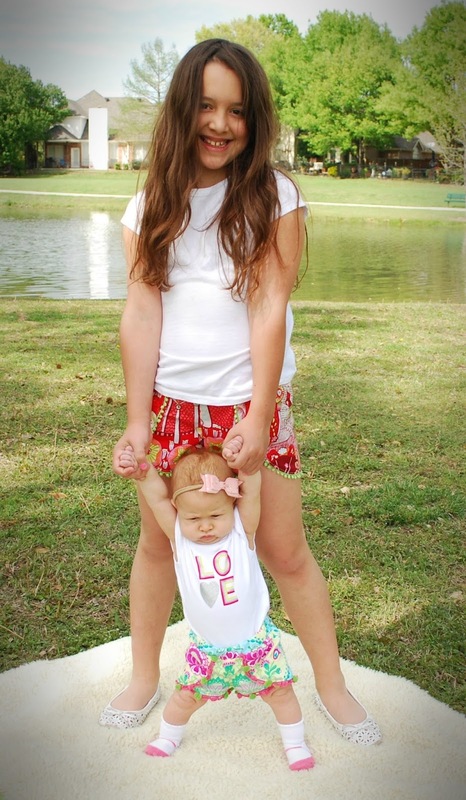 The red shorts on my 9 year old were from the Alexander Henry Fairyland collection. The gold shorts on my 7 year old are from my favorite pattern designer Anna Maria Horner's Garden Party Collection. Baby girl's shorts are made with a scrap I had of Michael Miller Lavinia in the Aqua colorway. I almost got a smile out of this one!! She is such a sweetheart. I loved how helpful her sisters were in this photo shoot. These two older girls are 22 months apart and the best of friends lately. They play Barbies, make slime, ride bikes and scooters, watch their favorite shows, and giggle all the time. They also know how to get under each others skin pretty quickly! I am so glad they have each other! They are also super helpful with this little girl and have made having a 5th child not as stressful as I had thought it would be. 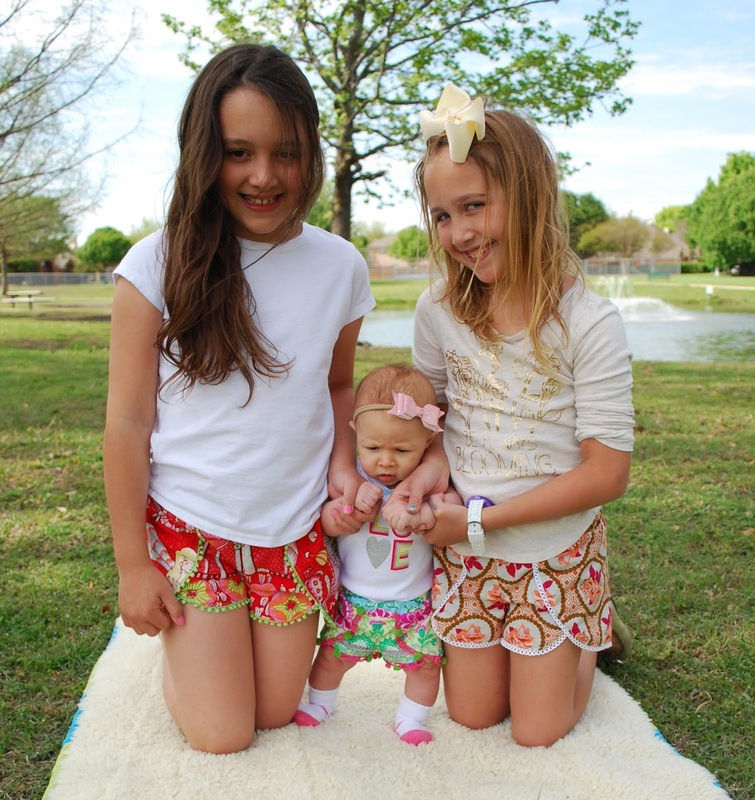 They are so happy to have another sister and usually grab her up quickly if she asks to be held. 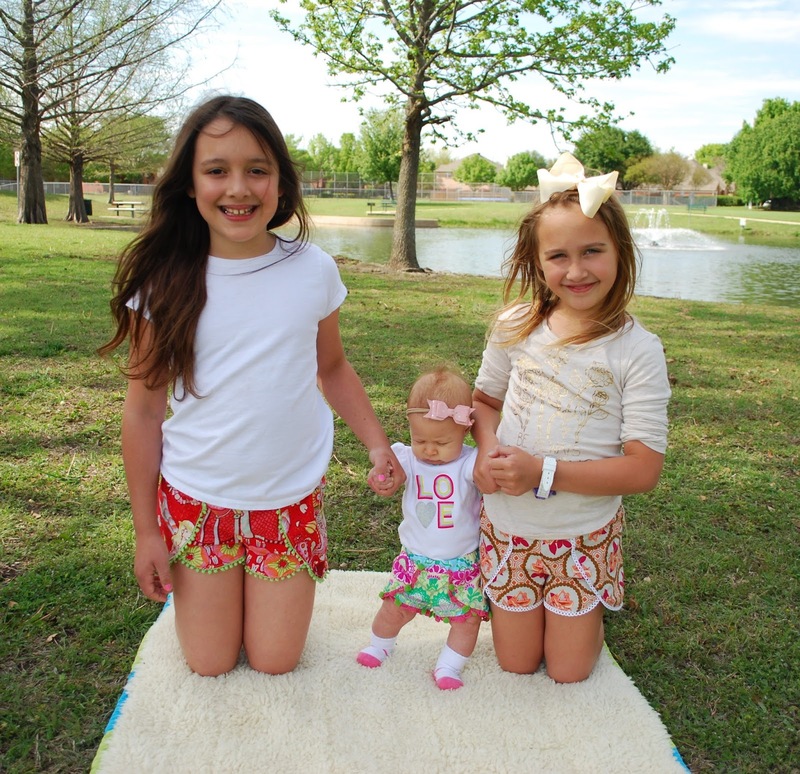 I know this may be photo overload, but I just couldn't get enough of how cute all three of them looked! You can get a copy of the pattern here.